Are you looking for Pump Maintenance For Commercial Buildings in NYC? NY Pump & Motor Repair has been providing Pump Maintenance For Commercial Buildings in NYC area since 1941 with prompt & professional Pump Maintenance services and great customer care. At NY Pump & Motor Repair we have been satisfying clients with prompt & professional Pump Maintenance For Commercial Buildings in NYC. We are available for our clients when they need us with 24 hour Pump Maintenance For Commercial Buildings in NYC. No Pump Maintenance problem is too big or small for NY Pump & Motor Repair. We understand that Pump Maintenance issues never arrive when you're ready for them so we offer 24 hour Pump Maintenance For Commercial Buildings in NYC for our clients' convenience. When you need us for Pump Maintenance we will be there fast to get your pump problem resolved. NY Pump & Motor Repair assures a minimal down time and a properly functioning pump by the time our Pump Maintenance service is completed. 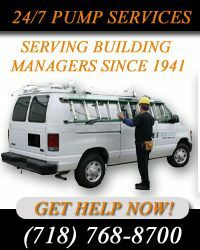 NY Pump & Motor - your trusted provider for Pump Maintenance For Commercial Buildings in NYC.